Watch a video about the world of dinosaurs. See Wiwaxia, Trilobites, Anomalocaris and other unusual creatures that lived in the oceans over 500 million years ago. Watch a video about Stegosaurus and its plates. Watch a video about the end of the dinosaurs. Find out what dinosaur hunters do. 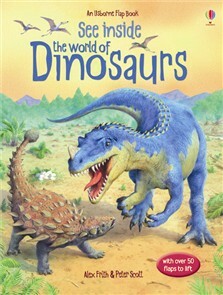 A fabulous flap book with over 50 flaps to lift, offering a glimpse into the prehistoric world of the dinosaurs. Stunning illustrations show how dinosaurs lived, hunted and how they died out. Flaps reveal extra facts, information and surprises. The See Inside Usborne is a brilliant series. This book is both informative and engaging. It starts by looking at early life in the sea, and finishes with how 'dinosaur hunters' attempt to uncover fossils nowadays.